The Skeptic's Field Guide: "Wheat for Weapons"
Channel Ten News continually refers to the AWB inquiry as the "Wheat for Weapons" scandal. I, mistakenly as it turns out, went to their website in the hope of finding out more, as they didn't say anything about weapons in their report. They didn't have anything there either. Gutted. I then did some research of my own, and I noticed that you and others in the Federal ALP have also refereed to the inquiry as the "Wheat for Weapons" scandal. Does someone in the ALP know more than they are letting on at present? Was the Australian Wheat Board actually trading wheat for weapons - the Government will be up the creek when that comes out! Though I can't help but wonder why exactly does the Wheat Board need weapons? I'm sure that will come out when all is revealed. Are you intending to save this revelation until the Government thinks they are off the hook? That's good politics. Love your work. By continually referring to the Cole inquiry as the "Wheat for Weapons" scandal Rudd et al are engaging in an Argument by Slogan in an attempt to make this misnomer stick in people's heads (it has a catchy ring to it after all). Though it mustn't be going quite to plan, as one can tell from the photo, which shows the lengths the increasingly frustrated Kevin Rudd is prepared to go to make this slogan stick. "This scandal is Aussie dollars for Iraqi bullets… It is wheat for weapons." Thank you for your email regarding the Wheat for Weapons scandal. In October 2004 the CIA published a report which found that Saddam Hussein had used the hard currency he had illegally obtained through kickbacks under the UN's Oil for Food Program to purchase military goods including weapons which were prohibited under the sanctions regime at the time. Before the war in May 2002 the US General Accounting Office also produced a report tabled in Congress which made very similar findings. Equally outrageously, the US Senate heard evidence from Iraqi officials in 2004 that Saddam Hussein used the money raised through kickbacks to pay the families of Palestinian suicide bombers. As the AWB was the single largest contributor to Saddam Hussein's slush fund (by a country mile) I believe it is accurate to describe it as a Wheat for Weapons scandal. 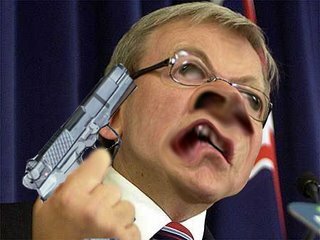 Technorati Tagged - Fallacy, Skepticism, Argument by Slogan, Kevin Rudd, AWB.